By the time Warburg turned his attention from sea-urchin cells to the cells of a rat tumor, in 1923, he knew that sea-urchin eggs increased their oxygen consumption significantly as they grew, so he expected to see a similar need for extra oxygen in the rat tumor. Instead, the cancer cells fueled their growth by swallowing up enormous amounts of glucose (blood sugar) and breaking it down without oxygen. The result made no sense. Oxygen-fueled reactions are a much more efficient way of turning food into energy, and there was plenty of oxygen available for the cancer cells to use. But when Warburg tested additional tumors, including ones from humans, he saw the same effect every time. The cancer cells were ravenous for glucose. Warburg’s discovery, later named the Warburg effect, is estimated to occur in up to 80 percent of cancers. It is so fundamental to most cancers that a positron emission tomography (PET) scan, which has emerged as an important tool in the staging and diagnosis of cancer, works simply by revealing the places in the body where cells are consuming extra glucose. In many cases, the more glucose a tumor consumes, the worse a patient’s prognosis. 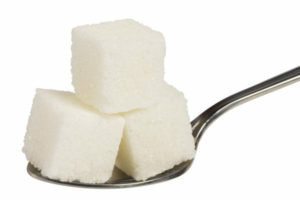 ...continue reading "Sugar and Cancer"